After many months of speculation, Google has finally taken the wrappers off its latest Nexus 6P smartphone, manufactured by new hardware partner Huawei. Has the new Nexus been worth the wait though? 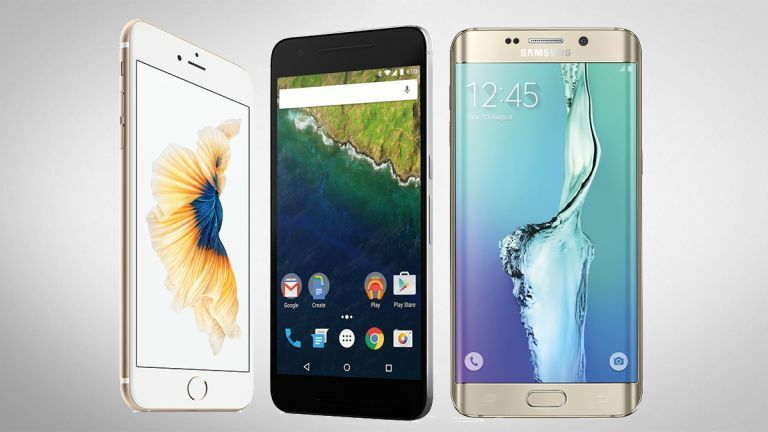 We decided to put it head-to-head against two of its biggest rivals from Samsung and Apple. In one corner we have the Samsung Galaxy S6 Edge+, the super-sized phablet version of the distinctive S6 Edge released earlier this year by Samsung. With a gorgeous curved screen, some top-notch specs and an impressive camera, it's one of the best smartphones in Samsung's history. Then there's the Apple iPhone 6S Plus: released earlier this month and already selling well, it's looking to capitalise on the popularity of the larger 5.5-inch design Apple introduced to the iPhone range in 2014. With tricks like Live Photos and 3D Touch up its sleeve, Google has got a job on its hands trying to keep up. There's a rather strange bulge at the back of the Nexus 6P - it allows the antennas to function, apparently - but otherwise it's a stylish-looking device. The first all-metal Nexus smartphone, the aluminium finish screams quality. Despite having the same chassis size as the iPhone 6S Plus, it has a slightly larger screen (5.7 inches vs 5.5 inches). The Galaxy S6 Edge+ is by no means ugly either. It's sleek, curved and - dare we say it - rather iPhone-esque. The way the display folds around the side of the device is sure to turn heads and Samsung does bright, colourful AMOLED screens like no one else. While the Nexus 6P and the Galaxy S6 Edge+ are both beautiful-looking phones, the iPhone 6S Plus just beats them both by a nose. The design Jony Ive unveiled with the iPhone 6 and the iPhone 6 Plus is a modern classic, and this year's models don't mess with it - it's hard to imagine how Apple could beat it. Google is making much of the camera inside the Nexus 6P, fitted with a 12.3-megapixel Sony sensor that lets in more light than ever and is apparently the best camera ever crammed inside a Nexus device. On top of that you get a fingerprint scanner (called "Nexus Imprint") and a USB Type-C port for faster charging and data transfer. Aside from that distinctive curved screen and the app shortcuts customised to take advantage of it, the Samsung Galaxy S6 Edge+ also offers its owners a speedy fingerprint scanner and a 16-megapixel camera that's been earning plenty of praise in reviews. As for the iPhone 6S Plus, the headline features that distinguish it from its predecessor are the 3D Touch pressure-sensitive screen and the Live Photos feature that turns your pictures into mini-videos with a single tap. All of the usual iPhone goodness is here too, including a camera that can hold its own with the best. The Nexus 6P is very much the premium option when compared against the Nexus 5X: the Snapdragon 810 processor and 3GB of RAM put it right up against the best smartphones of 2015. At this early stage we haven't had chance to put the Nexus 6P through its paces but its benchmarking scores should be impressive. Samsung, meanwhile, is never shy of pushing the limits as far as specs and components are concerned. The Galaxy S6 Edge+ comes fitted with Samsung's own high-speed octa-core Exynos 7420 processor and a whopping 4GB of RAM - in a straight race, the S6 Edge+ would probably come out on top of the three phones here. As for the iPhone 6S Plus, the speed of Apple's phones have always been about the efficient fusing of hardware and software. Inside the handset there's a new A9 chip developed by Apple itself, and while it doesn't hit the same heights as some other CPUs in terms of its raw specs, the control Apple has over the whole device means the processor produces 70 percent greater performance than the one in last year's iPhones (and with just 2GB of RAM). Android 6.0 Marshmallow is the ace up the sleeve of the Nexus 6P: as well as introducing features like improved battery performance, Google Now on Tap and native support for fingerprint recognition, it builds on the Material Design launched with Lollipop to create a colourful and flexible interface that makes iOS look rather drab and static in comparison. Samsung's Galaxy S6 Edge+ runs Lollipop and will eventually be in line for a Marshmallow upgrade, albeit with Samsung's own TouchWiz skin on top. Parts of it are useful - such as the features that take advantage of the screen edge - but as a whole it's hard not to prefer the clean, stock Android experience provided by the Nexus devices. The brand new iOS 9 brings plenty of useful features of its own: a smarter Siri, a low power battery mode, and (at last) a back button of sorts. It's the best iOS yet of course, but overall it feels like Android is the more innovative mobile OS at the moment - perhaps Apple should put some of its hardware design team on software instead. There's something to be said for all of these phones (or phablets): they're all excellent handsets and the differences between them aren't huge. In fact the one you're going to prefer is probably going to depend on your previous experiences with hardware and software from Google, Samsung and Apple. In terms of raw speed, independent benchmarks show the iPhone 6S Plus is the best smartphone out there at the moment - and in terms of looks it's difficult to find a better designed phone. On the flip side, we think Android 6.0 Marshmallow just about has the edge over iOS 9 at the moment. What's certain is that the big, bright, all-metal Nexus 6P is a worthy opponent for Apple's latest phablet. The Samsung Galaxy S6 Edge+ is more of a niche choice - not only in its curved edges but also its eye-watering price - but again it's a device that's going to find its way to a lot of satisfied customers.